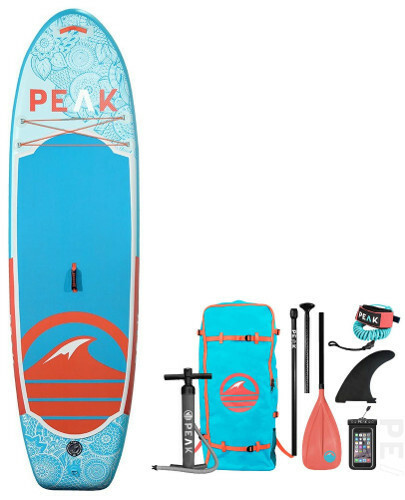 Peak Paddle Boards are here with us today with one of their most attractive inflatable standup paddle boards; the Peak Yoga Fitness iSUP, which is designed specifically for yoga enthusiasts. After more than a decade, this brand made itself known for its high quality and great complete iSUP packages for each board of theirs; each package is neat and compatible with the board making the whole thing look very fashionable and sporty. In this review, we’ll take a closer look at the Peak Yoga Fitness iSUP in an attempt to reveal all its features and qualities. The Peak Yoga Fitness iSUP is 10 feet long which is pretty great not only for yoga, but also for touring and recreational paddling thanks to its all-round design. This exact measurement is quite standard for many iSUPs out there; however, it’s absolutely not random. Those 10 feet are easy to handle by anyone even if it’s a beginner, allowing him or her enough space for all yoga positions and routines. Another important aspect of a yoga board is width; the Peak Yoga iSUP is 32 inches wide which is a number that you won’t find on other regular boards. Being this wide makes the board super stable in different water conditions, and with little practice, you’ll easily experience the stability of the Peak Yoga iSUP especially in flat water. Finally, this iSUP is 6 inches thick for a maximum weight capacity that reaches 275 lbs. Two fully grown up adults can enjoy a swift ride on the Peak Yoga iSUP without having to worry about it flexing or submerging under water. The Peak Yoga Fitness iSUP is made of first quality Korean drop-stitch and lightweight military grade dual layer PVC which both are known for making any inflatable board or kayak super strong, light and durable. The double layers make sure the board is protected against bumping into sharp materials. However, that doesn’t mean that the board will always survive such incidents, that’s why it’s highly recommended to be a friendly user when it comes to dealing with inflatable products. Looking at the Peak Yoga iSUP from a close distance; you can see how neat and professionally put together it is. And the best part about it is that once it’s fully inflated, it turns to be extremely stiff and hard which is a huge plus for yoga in terms or stability and rigidity. An awesome EVA traction pad that covers the majority of the board’s back. It’s thick and super soft for maximum safety and comfort when practicing yoga routines. Also, the navigation system is quite a good one thanks to the featured sharp and large fin; it’s 9 inches long, removable and very easy to attach/detach. This fin helps the board to easily adapt to different waters as the board can used in both salty and fresh water. Since this board is large enough for all different positions; you’ll find the usual storage area on the deck with 4 D-rings connected with a bungee cord. The best use for the bungee cord is securing the paddle to the board once you get to your destination. Also, there is a 5th D-ring for anyone who feels the need to attach a safety leash. Finally, you’ll find 2 rigid durable and rigid carry handles on this board to help you easily transport it once inflated. One handle is central while the other is right on the board’s nose. All in all, the Peak Yoga Fitness iSUP is an awesome board when it comes to quality and purpose. And with an amazing package, there is nothing to complain about really. This is where things get serious because no matter how good a board looks or how good of a package it comes in, performance is the real deal, and with the Peak Yoga Fitness iSUP I can tell you that you’ve got a good one. This board performs amazingly in terms of stability and balance especially in flat and calm water, which is initially where anyone should be playing yoga. The Peak Yoga iSUPs glides through water very softly making it feel so light you don’t have to make any tremendous effort to make it move. It’s pretty responsive that’s to the sleep design given to it; it’s an all-round iSUP, and those are usually meant to make long distance paddling trips and easy pleasant experience. Not only that; the Peak Yoga Fitness iSUP tracks very nicely, especially after you get the hangs of how to use both the paddle and your body to control it. However, this very same board is not meant to be fast, thus, don’t expect to win after you start a race with friends who own racing iSUP. A floatable and adjustable 3 piece alloy paddle with a nylon blade. A 10 ft coil ankle leash. A GRI high pressure dual action pump with gauge. A 9-inch nylon snap-in center fin. And a bonus water proof smart phone carry case. This could be the dream package for anyone who wants to start paddling right after getting the package; you won’t have to separately order anything at all; one order and you’re set to go. 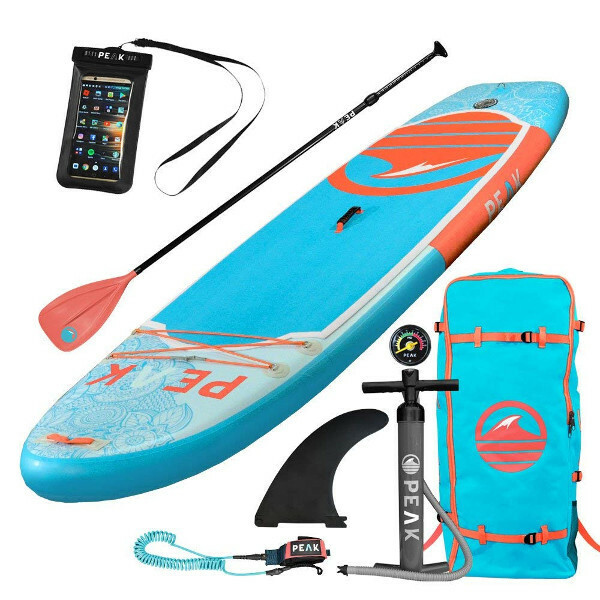 The Peak Yoga Fitness iSUP is an all-round board with a dream package that includes everything that standup paddling requires. It’s a very durable iSUP that is extremely stiff and rigid. It’s a light weight board once deflated for easy transportation and storage. It can take up to 275 lbs which would be 2 riders. The company allows you a 1 year warranty and 30 days return guarantee. I have to mention that the carry backpack is a great one that matches the board and paddle in color. The only thing I wished was different is the fact that the Peak Yoga Fitness iSUP comes in only one color choice which might not be very appealing for many male paddlers.